The incident took place around 10 am when the elephant was being taken back to Amballur after a function at a temple near Petta. Kochi: In a bizarre incident, a captive elephant, Amballur Karnan, while being transported on a truck, sustained a head injury after its forehead hit the roof a petrol bunk near Petta on Sunday morning. It was the petrol bunk staff who noticed it as the truck drove in and immediately alerted the driver. 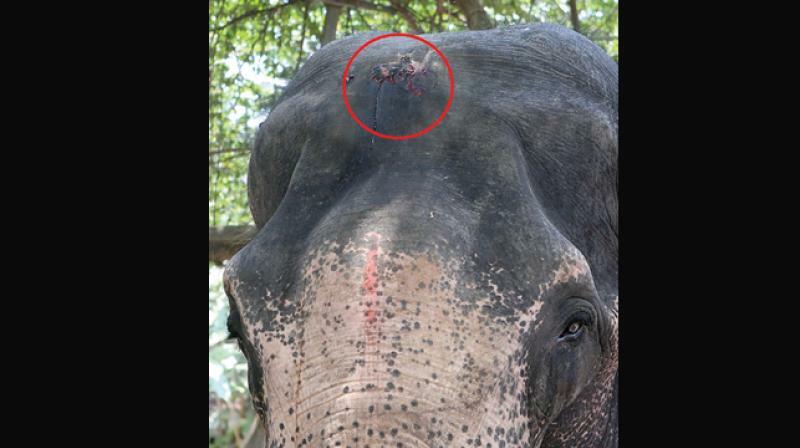 Though it was driven back, the elephant sustained injuries on its forehead. Sources said that portion of the elephant's skin from its forehead got scraped off and as of now Karnan is stable. The elephant was treated at an elephant shelter in Tripunithura and taken to Amballur where it is currently stationed. The forest department registered a case under the Wildlife Act. According to forest officials, it was illegal to transport the elephant during the daytime. "The other offence is causing injury by reckless handling," an official said. "A veterinarian of the forest department will inspect the elephant, and if necessary transferred to an elephant camp. It has been given preliminary treatment and is alright for the time being." According to him, a report in this regard would be filed in the court which will decide on the appropriate action against the owners of the elephant. Meanwhile, officials are also planning to invoke hunting charges as well. They said that causing an injury could also be considered as hunting as the law recognises hunting from a broader perspective. They will also seek legal help before invoking the charge.